Raumfahrt+Astronomie-Blog von CENAP - Blog: Astronomie - Warum ist der Mars rot? Astronomie - Flammendes Inferno auf der Sonne: Fragmente von Plasma fliegen mehr als 350.000 km hoch. Astronomie - Kometen Wild 2 Staub: Ein Blick in die Geburt des Sonnensystems? Astronomie - Warum ist der Mars rot? The planet’s rusted iron dust was most likely caused by liquid water, says Roger Rassool. You don't need a powerful telescope to see the deep reddish glow of Mars. It’s easily spotted through binoculars and, on clear nights at certain times of the year, with the naked eye. The ancient Romans revered the planet for its colour and the Egyptians called her “desher”, or “the red one”. But of all the planets in our Solar System, Mars is the only one that’s red. Why is it so? The reddish colour is caused by the presence of oxidised or “ferric” iron in the form of red hematite (Fe2O3). We have plenty of that rusted red rock here on Earth. To form, it required oxygen and the source of that oxygen was life. The earliest evidence comes from 3.8-billion-year-old banded iron formations in West Greenland which correspond to a boom-and-bust growth cycle of photosynthetic cyanobacteria. They thrived on the CO2-rich atmosphere, and emitted oxygen as a waste product. But Mars, as far as we know, has no cyanobacteria. So where did the oxygen come from to produce the crystals of hematite in Martian dust? There’s precious little oxygen in the atmosphere – only 0.13%. Carbon dioxide makes up the lion’s share at 95.3% and 2.7% is nitrogen. The most likely source is water. Thanks to data gathered by infrared instruments on satellites orbiting Mars and ice clouds photographed by the Mars Opportunity Rover in 2004, we know that Mars has frozen water. It lies about a metre below the surface near its South Pole and buried below the bright white CO2 ice sheets at the polar ice caps. But in order to cause all that rusting, water has to be liquid. Peering through telescopes, we’ve not yet found liquid water on Mars. But the rovers trundling around the Martian surface have given us hints of its liquid water-rich past. Astronomers have noticed what looked like water channels ever since Italian astronomer Giovanni Schiaparelli pointed his telescope at the red planet in 1877. Some even thought the channels might have been engineered by Martians. They were wrong, but as the 2004 Spirit and Opportunity rovers showed, water courses certainly do criss cross the surface. The rovers beamed back images of carved valleys, imprints of meandering streams and pebbly rocks. Mars had once been wet and therefore much warmer than its current below-freezing temperature of around –55° C.
More evidence of water on Mars came in August 2014 when Curiosity beamed back photographs of evenly layered rock near its landing site in Gale Crater. It was typical of sediments formed at the bottom of a lake. The year before, Curiosity drilled into a piece of Martian rock called “Cumberland”. There, bound to minerals in the rock, were molecules of water trapped a long time ago. Normally, water is made up of two hydrogen (H) atoms and one oxygen, but sometimes one or both hydrogen molecules is replaced with a heavier deuterium (D) atom. Around one hydrogen molecule in 3,200 is replaced with deuterium. 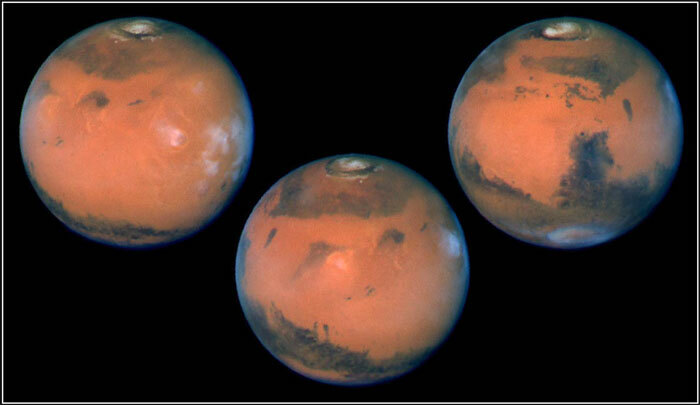 On the Martian landscape, normal liquid water can evaporate while “heavy” water molecules stay on the surface. As the ratio of heavy to normal water changes with time, it lets us measure how long the water has been around and how much there once was. Curiosity found the Martian D-H water ratio was about three times that on Earth. That means Mars had liquid water around 4 billion years ago. Could it all have ended up frozen underground? We’ve long wondered. In March 2015, NASA scientists published their answer in Science. Using Earth-based infrared telescopes to peer at the Martian atmosphere, they measured how much heavy water was frozen away in the polar ice caps. Using that number they calculated the planet once had 20 million cubic kilometres of water sloshing around – more than the volume of the Arctic Ocean. Not now though: only 13% of that water is accounted for by the ice at the poles. So 87% of the water Mars once had has been lost to space!